Crisis Management Implementer or CM-300 is a 2-day intermediate course with a two and half hour 100- Multiple Choice Question (MCQ) based examination, following the successful completion of the course. The course is an experiential facilitated workshop led by several experienced and practising professionals who have to manage and implement crisis for their own organisations. Usually, the crisis management (CM) team consist of the senior management team who will make the decisions, however, the implementation, maintenance and coordination of the crisis response rest on the shoulders of the designated Organisation BCM Coordinator and the appointed BCM team. This intermediate-level course is suitable for professionals assigned roles and responsibilities to support or to manage their respective areas within the CM program for your organisation. The intermediate course emphasised on the grounding of the CM knowledge, the structure for the design and development of the CM effort of the organisation and the integration of the other plans. This course is appropriate for organisations embarking on its crisis management journey after the completion of its Business Continuity Management (BCM) and Disaster Recovery (DR) implementation effort. 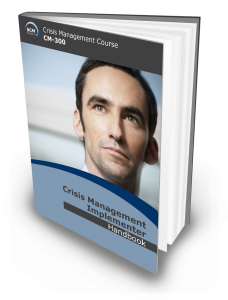 In order for all of the members of the crisis management team and its supporting contingent to implement a coherent plan, this course will help ground all the designated (core or supporting) members to have the correct knowledge to implementing its respective specific area of the crisis management plan. For those organisations who already have a CM plan, the participants will take away and use the toolkits and knowledge to evaluate the effectiveness and efficiency of their CM program. Tools and templates will be provided to develop specific crisis management plans and the key is to contextualise to your environment. Using a case study and experience sharing by the facilitator, this course has been recommended by past participants to be a practical course that will take the participants through the proper implementation of a CM plan. CM Certified Specialist (CMCS) Certification is awarded to participants who successfully completed and passed the Qualifying CMCS examination attached to the course, sends in an application detailing at least 1 year of CM experience , make the application processing fee payment of SGD75 and satisfies and meets the experience requirements of the independent certification body. Manage the crisis management together with other plans such as BC and DR.
Novice professionals designated for crisis management (CM) roles and responsibilities. Experienced CM professionals who want to have a formal walkthrough and a complete understanding of his/her organisation CM effort. Appointed members of the CM team who is updating, reviewing and managing the CM plan. Appointed member who is managing the command centre operations/ emergency operations centre. Novice and newly appointed CM and support teams members who need to upgrade the CM skill and knowledge within a limited time span. Organisation Business Continuity Management (BCM) Managers/ Coordinators who need to integrate and train the CM team. Security, Facility, Administration, Crisis Communication (CC), IT Disaster Recovery (DR) and other designated Team Leaders who are members of the CM support and Operations team.